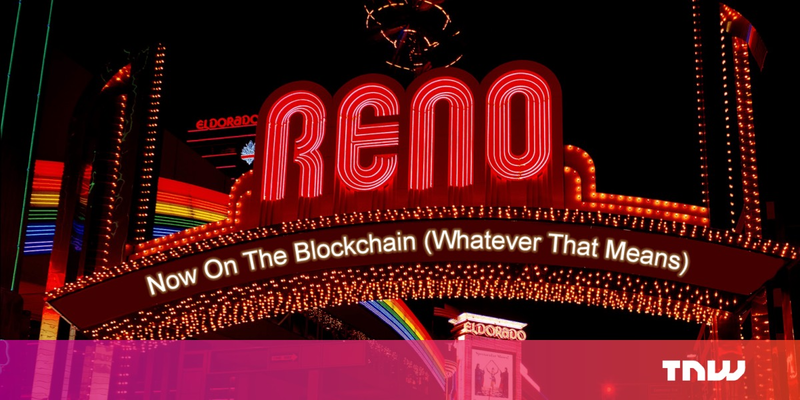 A tiny county surrounding Reno, Nevada will soon be the first in the nation to make your marriage blockchain official. How it works: The Washoe Country Recorder’s Office is collaborating with a Nevada-based startup called Titan Seal to test a blockchain-based solution for a problem you probably didn’t realize existed. Currently, couples seeking an expedited marriage certificate have to call the Recorder’s Office to make the request, and then eat the charges associated with overnight or second-day delivery. The new system would digitize all marriage certificates on the Ethereum blockchain, ensuring protection from loss, damage, or changes. Rather than waiting five to seven business days to receive a certificed copy, the new program could have it in your email inbox within minutes. The bigger picture: We had a little bit of fun with this one when discussing it in our Slack group, but it points to a future where blockchain is the tech called upon to solve all sorts of similar problems — or to create new ones out of thin air, only to solve those too. Jokes aside, moving to a paperless system is long overdue in government, and if it starts with blockchain technology storing marriage certificates in Nevada, so be it.